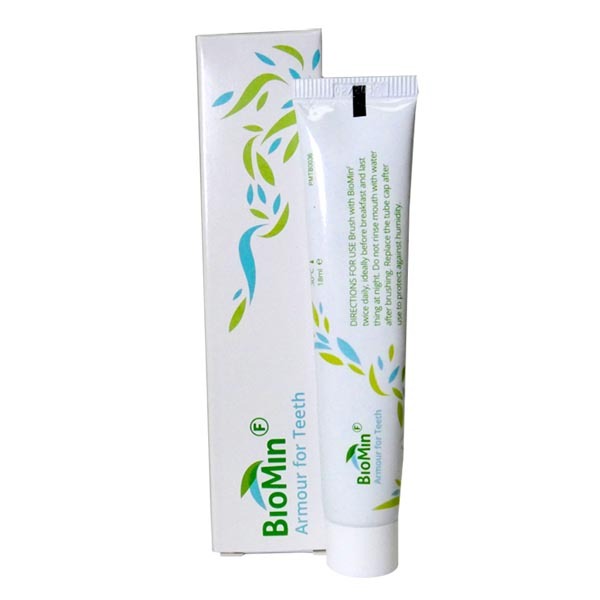 This Travel Tube (18ml) is a handy size to slip into your overnight bag for trips away or to sample the benefits of BioMin F without having to buy a regular sized tube. BioMin F toothpaste releases the optimum level of fluoride together with calcium and phosphate to creates a protective layer (Armour for Teeth) over the tooth surfaces for up to 12 hours after brushing. No other toothpaste does this. This Armour forTeeth, called fluorapatite, is 10 times more resistant to acid attack (such as when drinking fruit juice and fizzy drinks) than the protection given by other leading toothpaste brands. The fine BioMin F particles have low abrasivity to minimise wear of the enamel when brushing. They are similar in size to exposed dentine tubules (pores) which lead to the nerve endings causing pain from cold foods and drinks. The tubules are therefore blocked and most patients report a rapid reduction in sensitivity and improved quality of life! BioMin F gives excellent all-round protection. Brush before breakfast and before going to bed. The foam after brushing should be swirled around the mouth and then spat out. Rinsing will reduce the effect of the toothpaste.